As we announced on Wednesday, our first knit-along of 2017 will be for a fan-favorite Berroco pattern—Mrs Watson, designed by Martina Behm for Portfolio Volume 1. I’ve got the pattern ready to go, now it’s just a matter of waiting until February 1 and figuring out my yarn! This is a Choose Your Own Yarn KAL—all we ask, to participate officially in either the Ravelry forum or the Facebook event, is that you use a Berroco Yarn or yarn from one of our yarn partners (LANGYARNS, Amano Yarns, James C. Brett, or Ístex Lopi). Of course, that’s where I’m having trouble—picking out my yarn! The pattern calls for Berroco Ultra® Alpaca Light, which is a sport-weight blend of alpaca and wool. It’s available in 33 different shades, so there’s sure to be two colors of Ultra Alpaca Light that appeal to knitters. Another sport-weight contender is Berroco Cosma®, a blend of alpaca, wool, and silk. Cosma has fewer color choices, which can be good if you, like me, are known to deliberate over color choices for ages. I’m kind of tempted to change things up a little bit, however, and knit Mrs Watson in a heavier yarn. Berroco Ultra® Alpaca would obviously be the option closest to the original, as it’s the same blend of yarn spun into a worsted weight version. And there’s more than enough colors of Ultra Alpaca to consider. Plus, if I wanted to add a bit of a variegated feel to it, I could combine a solid Ultra Alpaca with one of the Berroco Ultra® Alpaca Tonal shades. Berroco Vintage®, which knits at the same gauge as Ultra Alpaca, is another option for a worsted-weight version of this shawl. For something completely different, there’s Berroco Fiora™, a blend of plant and synthetic fibers that has a gorgeous sheen. It knits at a similar gauge to Ultra Alpaca Light but will behave differently due to the fiber content. This would make a lovely shawl to drape over your shoulders if you just need a little something extra on a warm evening. Another option is Berroco Artisan™, which has a hand-painted effect on a merino and silk blend yarn. The tonal variations in the dye would make for a really interesting Mrs Watson! I’m kind of leaning toward a really “out there” sort of option, though. Maybe Berroco Remix®? This yarn is really fun to knit with—I’ve got an Astilbe cardigan on the needles using this yarn—and the recycled fiber content is nice and comfortable. But I’m also thinking I may go a little crazy and choose Berroco Inca Tweed®. Something about the tweedy flecks is really calling to me, and choosing this bulky yarn would make for a nice oversized wrap when it’s finished. I think I’m leaning toward a gold and grey or black combination—it appeals to my inner Hufflepuff, and those two colors go together so nicely. Let me know what yarns or color combinations you’ve chosen for your own Mrs. Watson in the comments! On the tweed thought, I was looking at some Lang Yarns “Yak Tweed” during my last LYS visit while shopping for the KAL. That yarn pairs very well with the Ultra Alpaca, too! Oooh the Lang Yak Tweed would be absolutely delightful! Beautiful colours . Fantastic designs . Berroco Remix is one of my favorite yarns. I already purchased Ultra Alpaca light yarn in Moonshadow and Winter White. I am tempted to change my mind and go with Remix. Hi Gabi. I have used Remix for Berroco patterns that have called for its use; Deran, Maxim, Safarian (twice), and Capron. I have been very satisfied with how durable the yarn has been. The yarn does have some stretch to it so I cannot tell you with 100% certainty that it would hold its shape for this pattern. When I saw this KAL, Remix did not cross my mind as a yarn to use. It is an interesting suggestion and one that I am considering. I currently have my Remix stash tagged to make a “Roosevelt Cardigan”, and I’m looking forward to knitting that. See you at the Mrs. Watson KAL! BTW, I think your choice of Moonshadow and Winter White is VERY STYLISH! Amy if you use Berroco Inca Tweed would you need more wool? and needle size? Hi Norma! I haven’t had a chance to swatch with Inca Tweed, so I’m not sure how much I’ll need or which needle size I’ll go with just yet. I’m guessing that I’ll need 5 skeins of one color and 4 of the secondary color, and I’ll probably use the recommended size 10 needles. If you’re thinking about using Inca Tweed and want to get your supplies sooner rather than later, you could ask your LYS what they’re return policy is on unused yarn—so you could buy enough to make sure it’s all of the same dye lot, and return any that you may not use. Do we need to purchase pattern pre as well? You can purchase the pattern whenever you wish—if you want to buy it today, that’s great! If you want to wait until Wednesday, February 1, that’s fine too. Got the pattern, The yarn is coming, I am useing as pictured BUT been practicing, with scrap yarn, the w&t and For some reason CANT GET IT ACCORDING TO THE DIRECTIONS. The pattern eaither has an error or missing or conflicting info as to RS and WS. no matter what I do I still have a hole. HELP EMILY! Everything i can find on you tube and advanced directions tell me to Pick up. On my pattern there is also a ” Note” in the Body pattern 1 area right after Row 2 that says to ” pick up as described in the stitch glossary” The stich glossary says not to. ? If you’re looking at the pattern in the printed book, the note about picking up the wraps is an error. Typically, you do not need to pick up wraps when knitting short rows in garter stitch. Our friend Vickie Howell has a video that demonstrates working short rows in garter stitch here: https://youtu.be/cXRGuhi5Q8U?t=8m She’s only working the short rows on the right side, but since garter stitch is reversible, you can use the exact same method on both the right side and wrong side for Mrs Watson. 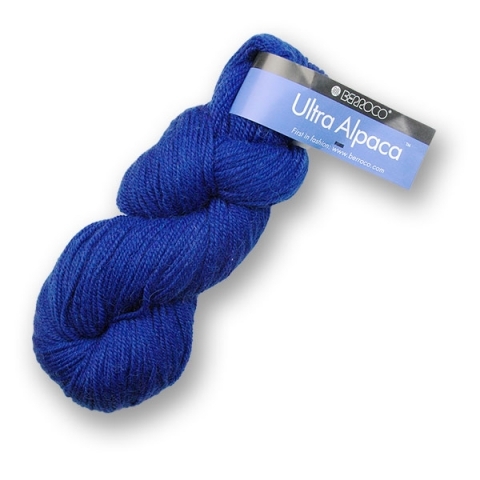 If I go with ultra alpaca, not the light version, should I change the recommended needle size? Yes, I would recommend that you change the needle size. One of our sales reps knit this shawl in Ultra Alpaca light and used a size 9 to knit the shawl, then switched to a size 10 for the bind-off. Hi. You mean ultra alpaca. Not ultra alpaca light, correct? Previous article Knit Mrs. Watson with us!